A culinary celebration featuring 20 local restaurants & chefs! Fine chefs from locally-owned restaurants (invitation-only). Signature dishes for sampling & fun by the FORKFUL! Live music, beer & wine, and a grand silent auction are included. Yap Ye Iswa is back! 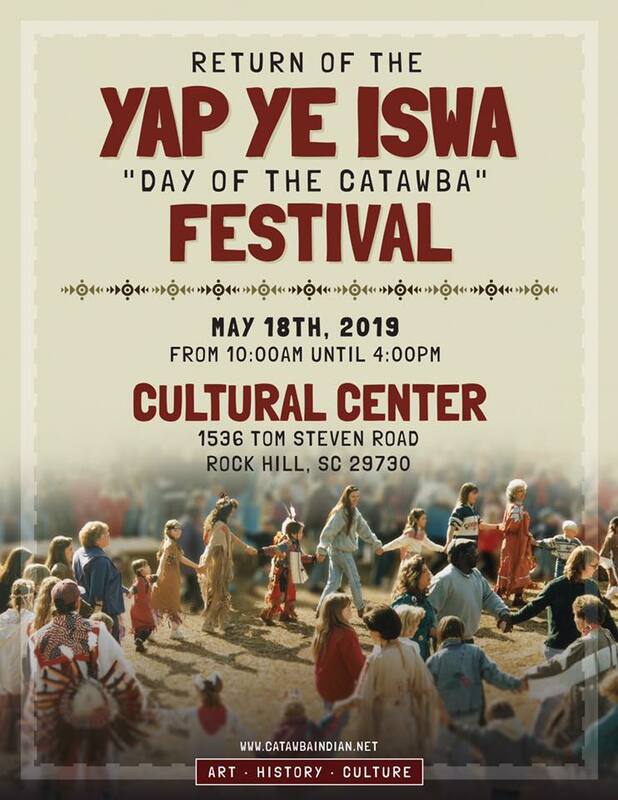 The heritage of the Catawba is celebrated by the Catawba Cultural Preservation Project, which holds a festival every year on the Saturday after Thanksgiving -- Yap Ye Iswa (Day of the Catawba). The festival is a way for the Catawba to celebrate their culture and share it with people of all backgrounds. Historic Rock Hill & the White Home are closed for the holiday weekend. Visit the historic White Home and see cars that span automotive history; from Rock Hill's own Anderson models to the muscle cars of the 1960s! Admission is $5 (children 6 & under are free). This event is a part of the Come-See-Me Festival and is a fundraiser for Historic Rock Hill. All proceeds will benefit our educational programming. Shop local vendors & meet talented artists at a beautiful historic setting all while supporting a good cause! Come out to the White Home and shop among the spring blooms of our gardens. Buy from local artisans in the heart of Rock Hill's downtown. We are requesting a $5 donation for admission per person (children 6 & under are free). All fees directly benefit Historic Rock Hill and our educational endeavors. This activity is a part of the Come-See-Me Festival. The White Home will be closed Friday, April 5th for a private event. 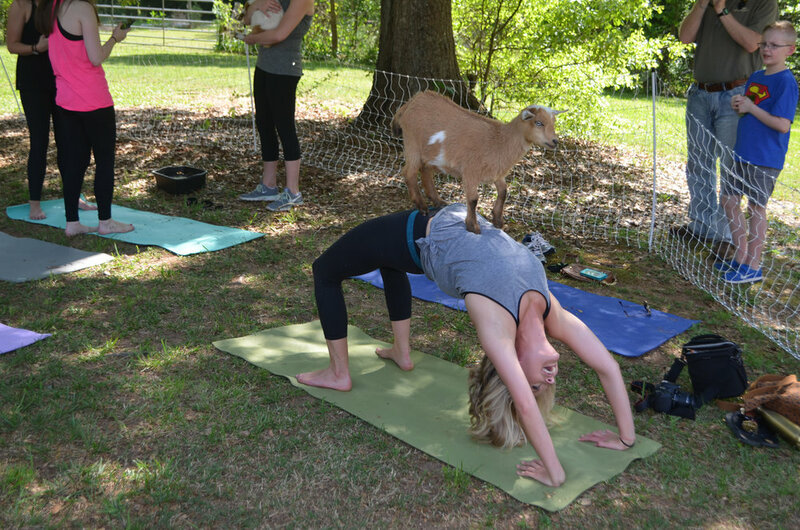 Check out Critter Creek Farm’s tribe of goats as they visit the White Home for Goat Yoga. Visit Critter Creek Yoga’s website for additional information and to purchase tickets! 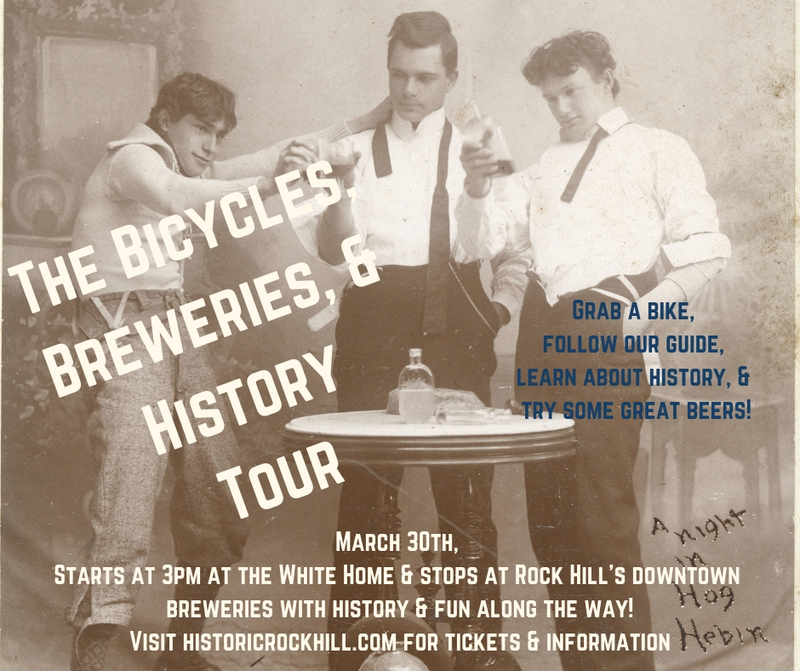 Learn about Rock Hill history and enjoy all of the new brewery's that Rock Hill has to offer. Bring your own bicycle or grab a Comporium bike and meet up at the White Home. We'll travel around Rock Hill, starting and ending at the White Home. Enjoy an evening ride, learn some great history, & enjoy discounts on beers! This event is a part of the SC Humanities Festival. Tickets are $5 and can be purchased through the link below. If you’ve ever looked in awe at the beautiful historic churches of downtown Rock Hill, then take part in our Church Architecture Walking Tour. Enjoy a morning jaunt at 10am or noon and learn about the history and architecture of Rock Hill’s oldest congregations. This event is a part of the SC Humanities Festival. Tickets are $5 a person and can be purchased through the link below. For the first time, Visit York County will host the 2019 South Carolina Humanities Festival on March 28-30. For the three-day festival, Visit York County has collaborated with various organizations in York County to provide a unique outlook on the culture and heritage of York County, South Carolina. In March 28th from 5:30 - 8:00 pm, the Humanities organizations of York County will gather together to celebrate at the White Home. Enjoy food trucks, live music, and great drinks and learn all about what the humanities of York County have to offer. Historic Rock Hill and the White Home will be closed today, We apologize for any inconvenience. Historic Rock Hill & the White Home will be closed Wednesday, March 13th through Friday, March 15th. If you have any questions or if you would like to schedule a tour when we return, please email info@historicrockhill.com! Learn about Rock Hill history and enjoy all of the brewery's that Rock Hill has to offer. Bring your own bicycle or grab a Comporium bike and meet up at the White Home. We'll travel around Rock Hill learning about the history of our city and you’ll get to purchase great beers at great breweries, starting and ending at the historic White Home. Take a spring jaunt through downtown Rock Hill and learn about the architecture and history of some of Rock Hill’s notable churches. Tickets are $5 and benefit Historic Rock Hill. This event is a part of the SC Humanities Festival. Come out to the historic White Home in downtown Rock Hill, SC to meet other industry leading professionals within the Wedding and event industry. The offices of Historic Rock Hill and the White Home will be closed today for our annual Board Retreat. If you have any questions, please email us at info@historicrockhill.com. The White Home will be closed today from 2-3 pm today. The White Home will be closed February 13th from 11am to noon for a private tour. The White Home will be closed for tours today from 1 -3 pm for a downtown walking tour. For information on scheduling your own downtown walking tour, call 803-329-1020. Historic Rock Hill and the White Home this afternoon due to meetings. Historic Rock Hill and the White Home will be doing some early spring cleaning. While the offices of Historic Rock Hill will be open, we will not be able to offer tours of the White Home during this time. If you have any questions, please email info@historicrockhill.com. Historic Rock Hill and the White Home will be taking a winter break this year. We will be open to tours by appointment only. If you would like to schedule an appointment or if you have any questions, please email info@historicrockhill.com. Decorated to celebrate the holiday season, bring your friends and family to tour one of Rock Hill's oldest homes by daylight and candlelight! A night filled with friends spreading good cheer while toasting the holidays this coming year!